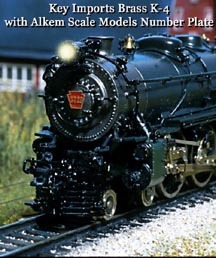 Add a distinctive finishing touch to your N Scale Pennsy Locomotive detailing project with these number plates. Based on dimensions of actual surviving number plates and including a custom drawn font, these plates will make the front of your Pennsy loco sparkle. The sheet includes 90 numbers representing many of the Pennsy locomotive classes.